Spiters Annihilation 3 is now live! If you loved Spiters Annihilation then you’ll love Spiters Annihilation 3! In this Physics based Puzzler developed by Alex2Dio your goal is to rid the world of the pesky purple monsters. Bob The Inventor is a Strategy game from BigDino. Conquer the planet with brilliant inventions and become a billionaire. Buy ‘ingredients’ and upgrades in the store. Combine them into an amazing invention and sell it in the right place. Try to become a billionaire inventor to finish the game! 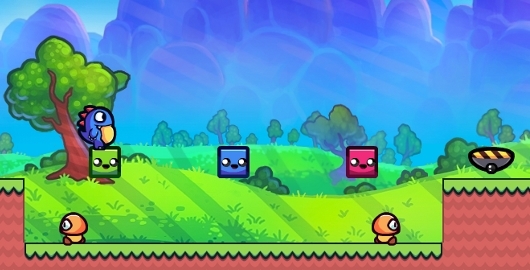 Grapple Cat is a Platform Running game from Bigdino. Escape a deadly tsunami in this one-button platform runner! Grapple Cat is just minding his own business on the beach, doing as ninja cats do, when suddenly a giant tsunami comes crashing in! Hop, leap, and grappling-hook your way over dangerous obstacles in this fast-paced retro platformer! Use your MOUSE to get past obstacles. CLICK to jump, HOLD and CLICK while in mid-air to grapple. Try to collect all achievements! 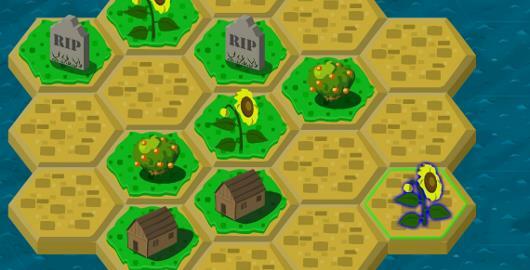 Fishtopia Tycoon is a Strategy game from BigDino. Catch, breed, sell and grow your company. Complete quests to unlock new game features. Colorize is a Strategy Puzzle game from BigDino. Press ESC to display menu options. City Wizard is a Strategy Puzzle game from BigDino. As the City Wizard you have the power to create a bush from 3x flowers. A tree from 3x bushes.. And so on.. It won’t be so easy though! Those pesky Zombies will try to make it difficult for you! Use your MOUSE for all. For game playing hints check the in-game tutorial. Freezy Mammoths is a Physics based Puzzle game from BigDino. Freeze and unfreeze mammoths and guide them to their warm igloos. Cover Orange: Wildwest from Bigdino is the latest in the Physics based Puzzle games Cover Orange. The game play remains the same: protect your fruits from the evil rain cloud by strategically placing objects on the play-field. Strikeforce Kitty is a Platform Running game from Bigdino. An upgrade based distance game where you collect clothes, weapons and armor to ‘dress up’ your army. Try to collect a full set costumes for special powers! Blast zombies off the screen with an arsenal of weapons! Select your weapon of choice and use your MOUSE to aim and fire. Dungeon Runner is a runner game from Bigdino. Find treasure, avoid pitfalls and get out of the dungeon! Use your Mouse to run and jump. Escape the dungeon by avoiding obstacles, collecting treasure and upgrading your character. Like before you have to get your hat back in each level. New game play elements include ropes, bouncy objects to interact with and a walking hat. Slow Slaw is a new Skill game from Bigdino and WhyTV. Make use of the ability to control time to escape a secret government lab. Use the UP Key or [W] to jump and double-jump. DOWN or [S] to slide. Time slows down when you get hit. Press the Spacebar to enable normal time speed. Cover Orange: Journey Pirates from Bigdino is the latest in the Physics based Puzzle games Cover Orange. Awesome Mushroom Hunter from BigDino and the developer of Awesome Tanks, Awesome Planes, Alexander Gette. What an awesome day for mushroom hunting! Nothing can possibly go wrong, yeah? Use the WASD Keys to move. MOUSE to aim and fire. SPACEBAR to interact. 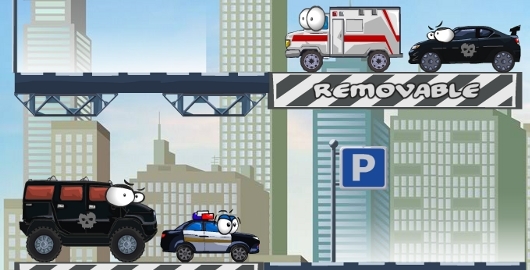 Vehicles 3: Car Toons is a Physics based Puzzle game from BigDino. The bad vehicles are back and causing more mayhem than ever! Restore peace to the streets by ramming them off the screen. Dino Shift 2 is a Skill game from Bigdino developed by FuzzyMintGames & Tyler. Your dino must be the same color as the blocks. Use the arrow keys to move and jump and the Z, X, C to change colors.